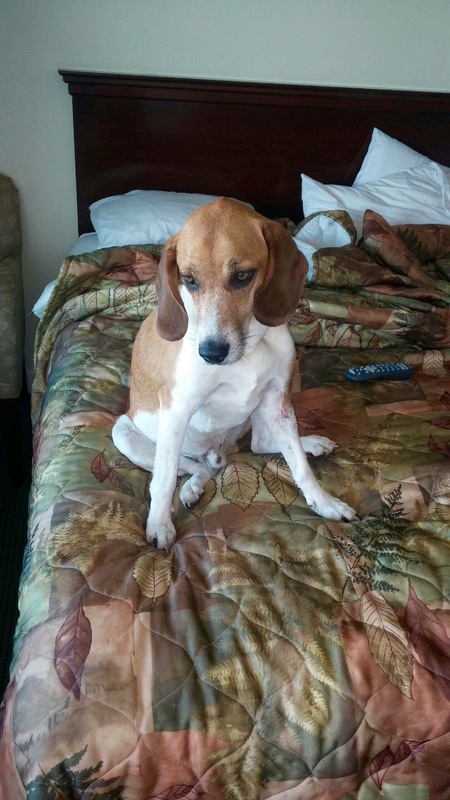 Yesterday I literally spent from 0630 to 1000 looking for Jumper, the beagle who became separated from his owner on the AT on Sunday June 21. I quickly printed the “Missing Dog” picture posted on social media by Maine Lost Dog Recovery and made 30 flyers. Armed with brad nails and small hammers we went to the Stratton trailhead where Jumper ran off earlier in the week. 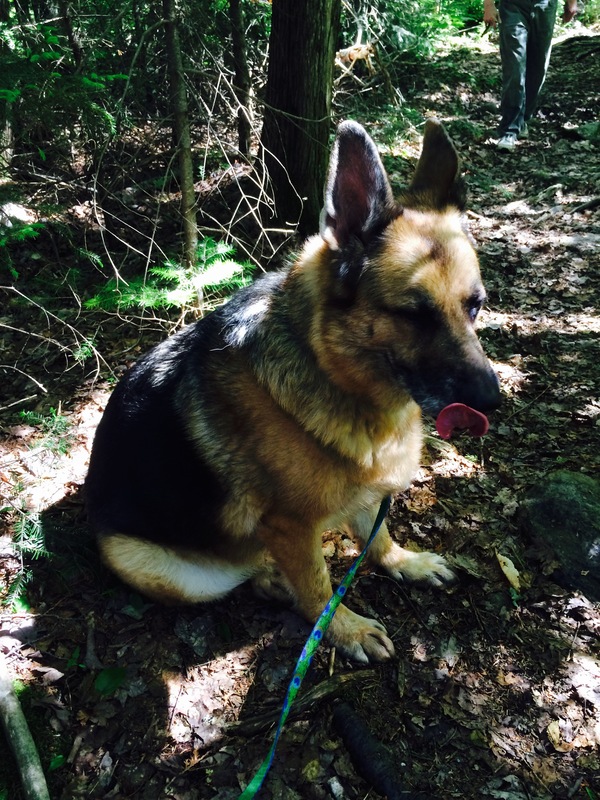 I went NOBO on the trail with my GSD Inga and my daughter went SOBO putting flyers on trees while hubby drove into Stratton proper and posted/searched. Now where do I look? Since Jumper’s owner Eric had been faithfully searching the trailhead area, I thought perhaps Jumper might follow their scent back in the direction they had come, north so I hiked as far as Avery Peak in the Bigelow range before turning back. Then we put the last of the flyers in Rangeley. I saw two hikers walking and asked if they had been on the trail and if so had they seen a loose dog (I didn’t mention breed). 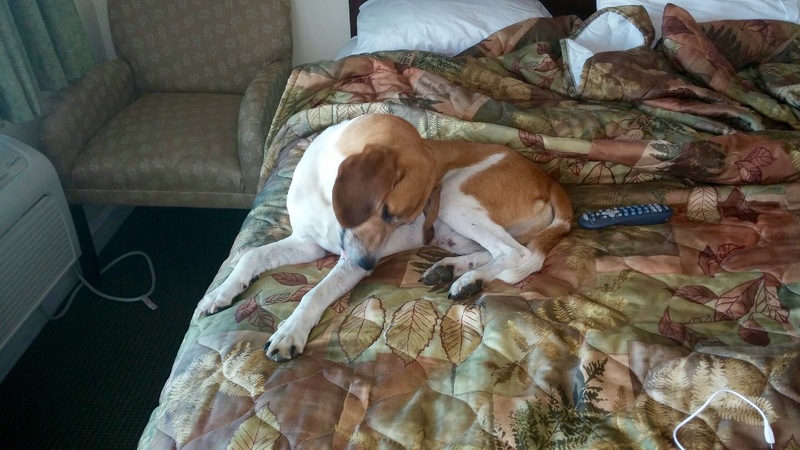 They were NOBO and said the previous day they had seen a brown and white beagle running with another dog near Piazza Rock. They remembered it because the dogs appeared to be alone. Theoretically it could have been Jumper they’d seen because the distance between the two locations via the AT is approximately 31 miles and he’d been lost for three days. Armed with this information we drove to a logging road, hopped on the trail and hiked to Piazza Rock. There were several dogs but all were with their owners. I left Jumper’s information with the caretaker and we headed home after stopping at the Hiker Hostel to alert them. The rest of the evening I couldn’t shake the image of Jumper from my mind so on a whim I did my first true night hike – back to Piazza Rock with Inga. Nothing but the sounds of wildlife. Dejected I texted Eric. By this time I was achy, cold and had a headache the size of Texas. My mind kept drifting back to Jumper and my fear that his pack would become ensnared on one of the many pipe size roots that I’ve come to despise. He would be trapped and susceptible to predatory animals that inhabit the area. 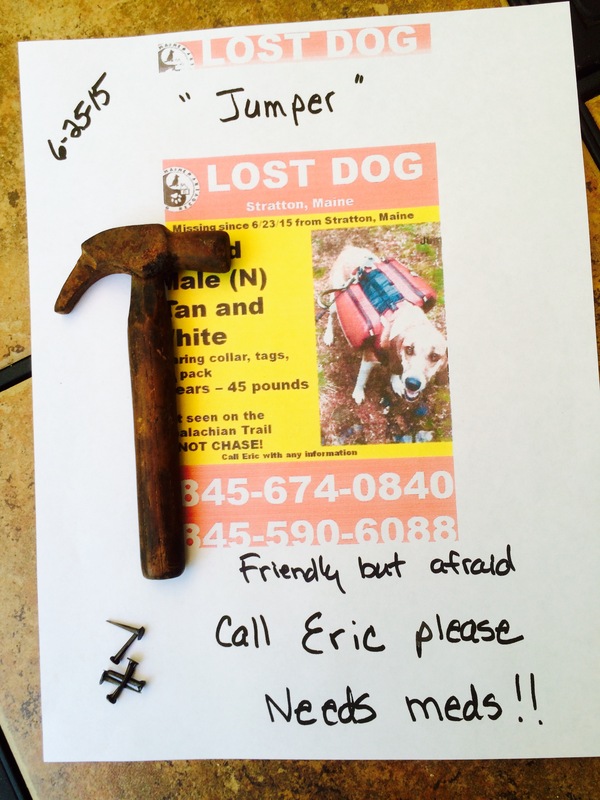 All of a sudden around 1100 I received a text from Eric saying Jumper had been found! I was ecstatic. Apparently some hikers saw the flyers and took a picture of it. Later they spotted Jumper wandering on the street close to Route 27 and called. According to Eric he was thinner, sans backpack, a bit shaken and exhausted. I am so happy because the thought of him never being found disturbed me. Yes I’m an animal lover, one of those people who puts my animals well-being atop the hierarchal ladder. You know the type – more than one pet yet not in the “Crazy Cat Lady Down The Block” category. Jumper will be going home with his grandparents who drove to Maine from New York with several other family members to join in the search. He’ll get some much needed rest, a medical exam and regain the lost weight. Once Eric finishes hiking the rugged terrain of Northern New England, Jumper will rejoin him for the more forgiving remainder of the trail. 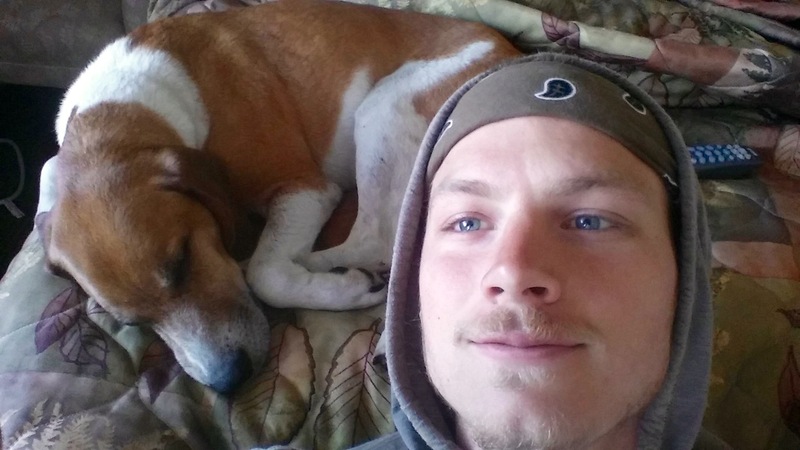 Eric is a wonderful young man who’s love for his dog humbled me. It’s been an honor to interact with him and I wish them the best of luck going forward in their journey. I know his parents are very proud of the fine young man he is. 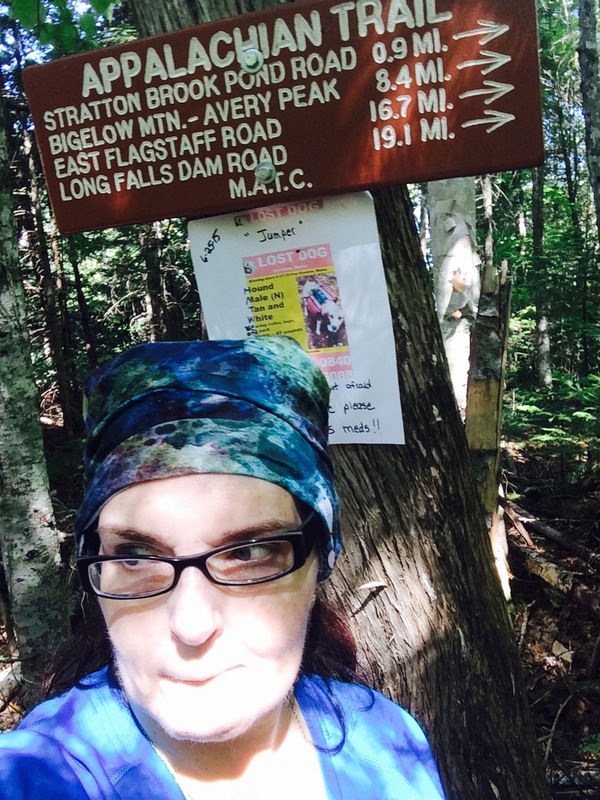 I hope I’ll meet them somewhere on the trail, IF I can manage to finish the last 148 miles and get out of Maine. Meanwhile, if you meet DreamWeaver and Jumper on the trail, please say hello. PS. I think Jumper’s trail name should be “JJF” for Jumpin’JoeFlash. Glad you Helped, I’m sure everyone is thrilled to be united again.